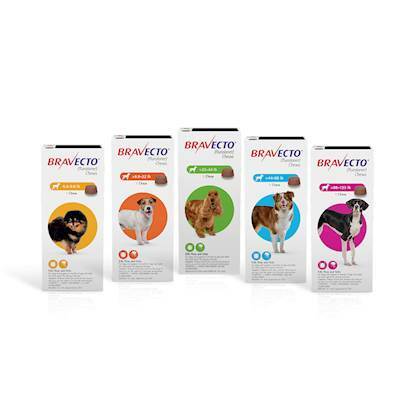 Bravecto is the original oral chewable protection against fleas! Protecting your dog for up to 12 weeks, and acting within 2 hours of use, Bravecto both kills and guards your dog from new infestations. It protects against fleas and 4 types of ticks: black legged ticks, brown dog ticks, lone star ticks, and American dog ticks. Since Bravecto works through oral chewing- your pup’s flea protection has never been easier! Rated 5 out of 5 by 56 reviewers. Literally the only thing that works for my dog. My dog will not chew these and eat them. Falvor is a great idea! Easy to use, no messy liquid to apply. Super easy to use and it works! This product makes life easier. Great product, so easy to use.